To my great shame, I have had one project languishing for the past six months, waiting for buttons. But today I finally sewed on the rest of the buttons... meaning my sweater is complete! And what timing - it's just before the summer solstice! Which means with the completion of my last socks, I have no outstanding projects! Woo hoo! Well, no real outstanding projects. Technically, I haven't finished the afghan I started for Dan back when we were dating. But I'm pretty sure if a project is older than a decade, it no longer counts. Pretty!! You did a great job! Thank you! I do love knitting sweaters - though they aren't near as instant gratification-y as socks! Gorgeous! I love it. Leah is right, you did do a great job! Thank you! 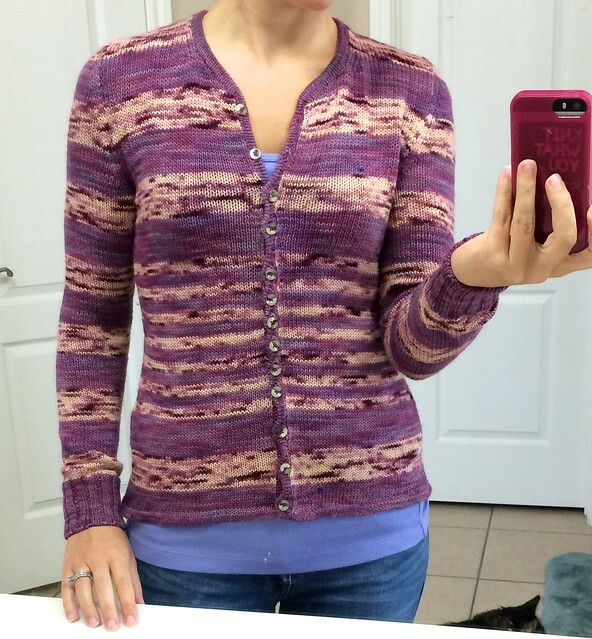 It makes me want to make another sweater now!